Pearl is included among gemstones only because it is a beautiful object used as jewelry. 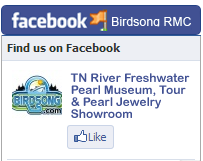 As has been noted, pearl is not mineral because it is formed by the action of a living organism. However, the pearl has long occupied an important position among jewels, and it is unique in requiring no lapidary art to enhance its beauty. Nature has perfected pearls. The ancient Chinese believed that pearls originated in the brain of a dragon.' We now know, of course, that pearl is created by a secretion of a mollusk. Very few mollusks have the ability to produce the fine mother-of-pearl used in the jewelry trade, and even among those that can, very few produce pearls with iridescence, or orient, as it is known in the trade. Only two genera, the pearl oyster (Margaritifera) and the pearl mussel (Unio) are important sources of the gem. Edible oysters rarely produce pearls, and when they do, the pearls are of poor quality. The shells of pearl-producing mollusks are composed of layers of calcium carbonate in the form of either calcite or aragonite. These layers, cemented together with an organic substance known as conchiolin, are known as nacre. The layer closest to the animal is deposited in tiny overlapping patches, producing an iridescent effect caused by the interference of light rays reflected from the plates making up the nacre. The same material coats the surface of a gem pearl. Seldom does a mollusk live out its time without attack by creatures boring through its shell, or without intrusion through the normal shell opening of tiny parasitic worms, sand, or other irritants. Usually inert particles are forced against the inside of the shell, where they are covered with layers of pearl that fasten them to the shell. This is the source of most blister pearls. When the irritant remains in its fleshy part, the mollusk deposits a protective shell of pearl to cover it completely, and a spherical pearl may result. Pearls of less-symmetrical shape, called baroques, are more common. The value of a pearl depends on its shape, color, orient, and size. Pearls of highest value are white with a faint tinge of pink or yellow, possess fine orient, are round, and are free of surface blemishes. The grading of pearls for color requires considerable experience to detect delicate differences. Various classification names, such as "rosée" for delicate pink shades, are used. Fancy colored pearls are those with a strong yellow, bronze, pink, green, blue, or black color. Grading for shapes, which differ markedly, is easier. Spherical pearls are usually drilled for beads; pear-shaped or drop pearls are used in earrings and pendants; and "boutons" or button-shaped pearls, with one flat side, are used for ear ornaments, cuff links, and rings. Irregular, baroque pearls and tiny seed pearls are used in jewelry designs with noble metals and perhaps other gemstones. 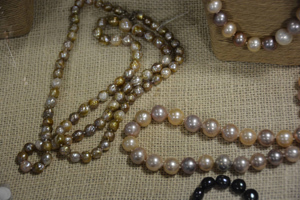 The world's finest pearls, called oriental pearls, come from the fisheries of the Persian Gulf. Fine pearls also are found off the coasts of Burma, Tahiti, New Guinea, Borneo, Venezuela and western South America, and in the Gulf of California. Freshwater pearls of high quality, formed in pearl mussels, are found in various rivers in Europe and the United States, especially in rivers in the Mississippi Valley. A method of growing cultured pearls has been well developed. A mother-of-pearl bead is inserted in the oyster as an irritant and the animal is replaced in the sea in a cage. When oysters so treated are recovered after a period of three to seven years the beads in the harvested crop usually are found to be coated with a layer of nacre up to almost a sixteenth of an inch thick. 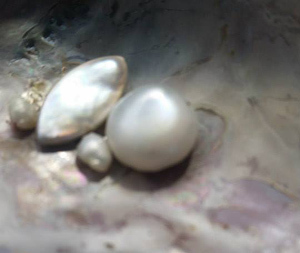 The cultured pearl can be identified only by the observance - through a drill-hole or by X-ray - of the mother-of-pearl core, which had been inserted in the oyster. An instrument called an endoscope, devised for rapid testing of drilled pearls relies on a beam of strong light, carried by a hollow needle The needle is inserted into the drill hole, and as it passes through the center portion of a natural pearl a flash of light reflected through a mirror system in the needle, is observed. Reprinted from "Gems in the Smithsonian Institution - 1965"